By not sending your bills out on time you are essentially offering interest-free financing and performing your services at a discount. Growing up in Western New York State, everyone either knew or knew how to get to “a guy” who could get you a little cash quickly if you needed it. Of course, this guy was not a Chamber of Commerce member, but if you needed it, guys like that were available. The deal worked something like this: They’d lend you a fixed amount of money, say $1,000. Until you paid all of that principal back, you’d pay “points,” typically on a weekly basis. “Points” usually represented grotesquely large (and most certainly illegal) amounts of interest. Failure to pay could result in a broken face. The basic “point” of the “points”: There is a time value to money. A dollar today is worth a lot more than a dollar tomorrow. By not sending your bills out on-time, you are essentially offering interest-free financing. Insofar as you don’t bill me for your work, you’re letting me use your time and effort at an implied discounted rate. To look at it from a different angle, if the client is a business, by not billing on-time you’re helping finance their business for free. Had you required cash at the time service was provided, the client would need to either pay the cash or get the cash. Getting the cash would’ve cost the client interest – the same interest (by analogy) that you essentially eat by not sending out a timely bill. Of course, ethically compliant retainers and evergreen situations aside, not a lot of professionals operate on an instantaneous pay-as-you-go basis. A little delay is normal and reasonable. But not several months. The lawyer’s “opportunity cost” of not billing is also significant. Think about what you could’ve done for yourself or your practice had you collected faster. Had you benefitted from getting that cash quicker, you might’ve been able to expand faster, do a little more advertising, and so on. 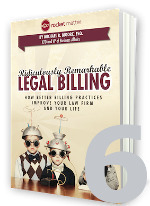 This post is an excerpt from the free e-book, Ridiculously Remarkable Legal Billing. Better billing practices improve your law firm and your life. Looking for an easy legal billing software solution? Check out Rocket Matter – our new QuickBooks Integration for Law Firms makes life easy for you and your accountant. Next articleDigital Forensics – When Does A Case Warrant It?